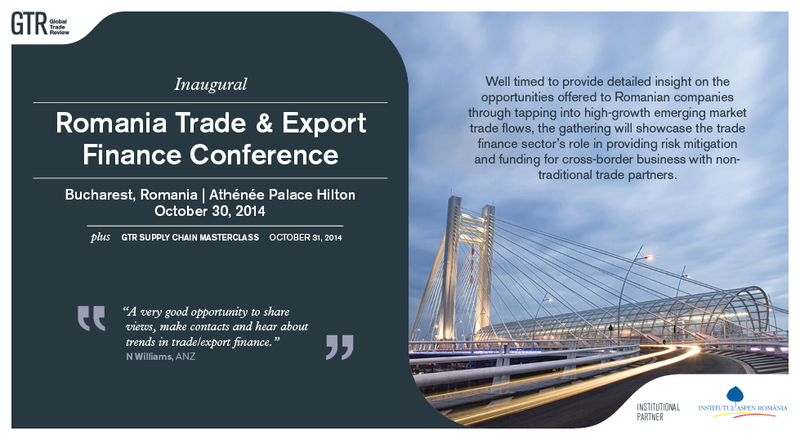 Aspen Romania is partnering with GTR (Global Trade Review), the leading trade, commodity and export finance media company, in organizing the inaugural Romania Trade & Export Finance Conference in Bucharest, Romania on October 30, 2014. Attracting representation from leading trade bodies and companies of all sizes (multinationals, mid-cap and SMEs), as well as financial institutions, this conference is well timed to provide detailed insight on the opportunities offered to Romanian companies through tapping into high-growth emerging market trade flows, the gathering will showcase the trade finance sector’s role in providing risk mitigation and funding for cross-border business with non-traditional trade partners. Huge emphasis will be placed on the importance of networking, where numerous opportunities will be provided over the course of the event to engage with key decision makers and establish new contacts. Delegates will also be given the opportunity to plan and organize private meetings with fellow attendees prior to attending via the pre-event networking website. Which way forward for Romanian exporters? What role can trade and export financiers play in supporting the diversification and growth of Romania’s corporate sector?